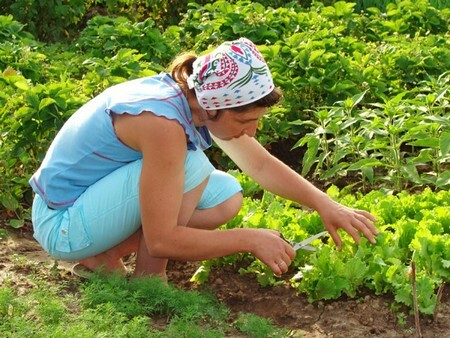 Crop rotation is one of the most important ways in which organic gardeners can maintain the health of their land and plants and, therefore, an essential part of annual planning. It simply means growing the same group of crops in a different bed each year. Vegetables can be divided into four or five main groups. Similar vegetables have similar growing requirements and are likely to suffer from the same pests and diseases. So it makes sense both to grow them in the same area of the garden and to move the whole group on regularly to avoid the build-up of problems. In addition the different crops can leave particular benefits behind them for the next crop. So the order in which the groups follow on from each other is also important. Each crop has its own pests and diseases. Moving them around prevents build-up. Each crop has its own feeding requirements Moving them means each bed receives the correct treatment in turn. Different crops have different effects on the soil. Moving them maximises the benefits to the soil and following crops. The exact grouping and order of rotations may vary from garden to garden. You may wish to grow more of one group than another and this will affect the space you allocate. However there are several “miscellaneous” vegetables that do not fit in with the main groups and can be used to fill the spaces. If you do not grow all the groups you may have only a three-fold rotation. On the other hand, if you grow a good range of vegetables, including potatoes, you may have a five-course rotation. Because the vegetables within a group are in the same botanical family they will attract the same pests: for example, all the brassicas will attract cabbage white butterflies; or they may suffer from the same diseases, such as, blight on potatoes and tomatoes or white rot on onions and garlic. Often the spores of a disease can remain dormant in the soil for years, and are woken up into activity when their host crop is planted. So the longer the rotation the better. Some vegetables need a richer soil than others. Some positively dislike a rich soil. For example, root crops such as carrots would be more likely to fork if planted in rich soil. Other vegetables like good feeding but prefer to be on ground that was manured for a previous crop. And they may prefer different levels of acidity or alkalinity. Because potatoes will be more liable to scab if the soil is too alkaline, and they are also greedy feeders, preparing the ground with manure and putting grass mowings in the trenches will create the right conditions for them. Brassicas, on the other hand, will suffer if the soil is too acid, so the brassica bed will benefit from liming before planting. Like everything else, brassicas will move along one section each year, and so this means that the whole garden will get limed once every four or five years. Solanums including potatoes, tomatoes, aubergines. This group would all benefit from manure. Feed tomatoes with comfrey. Onions including leeks, garlic, spring onions and shallots. They like a rich soil but not freshly manured. Legumes sometimes called pulses, including runner beans, broad beans, French beans, peas and several of the green manures. They would benefit from compost and will leave nitrogen for brassicas: including cabbages, kale, Brussels sprouts, calabrese, broccoli, cauliflower, turnips, swede, radishes and mustard. They like lots of compost, or well-rotted manure applied the previous winter, but also lime. Roots including carrots, parsnips, beetroot,celery, celeriac and fennel. These vegetables do not like a rich soil so require no special feeding. A crop may have a particular need for one nutrient and would leave the soil depleted if it was grown there for a number of years. On the other hand some crops benefit the soil because they are deep rooting, bringing up nutrients from lower down in the soil, or helping to break up the soil. The legumes have the ability to “fix” nitrogen from the air, storing it in nodules on their roots. This nitrogen is of particular benefit to the brassicas. So it makes sense to follow the legumes with brassicas. In year two the potato bed will move down to where the roots were. The roots will move up to the brassica bed and so on up the garden. There are certain diseases that last in the soil for a lot longer than five years, which is why prevention is better than cure. If you get a case of white rot in onions, for example, you will need to record where it occurred and avoid planting the onion family there for eight years or more. However, you could use that section of the bed, when the onions come round in the five year rotation, for salad crops or another unrelated crop. Crops of perennials—such as asparagus or globe artichokes—or crops that always regrow in the same place, such as Jerusalem artichokes, can have permanent beds. Salads can be tucked in to spaces in other beds. They are usually quick growing and can be used as “catch crops”, filling in a space in your sowing timetable. 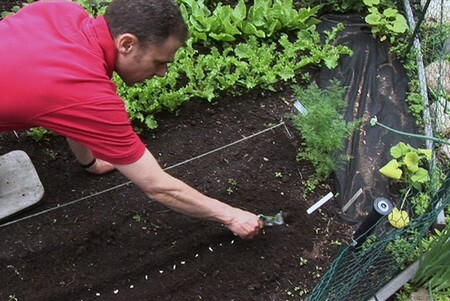 Remember that radishes and some of the oriental salad plants are brassicas and should go in the brassica bed. The cucurbits—such as pumpkins and courgette—all like good feeding and so could go in the potato section (or in whatever area you have a largish gap) with special extra feeding.